During the mid summer bed cultivation, Dowco will turn darker mulch from the bottom and rotate it to the top, refreshing your beds and allowing nutrients to get to the root zone of your plants. Over time, the UV rays from the sun will bleach the color out of your mulch. 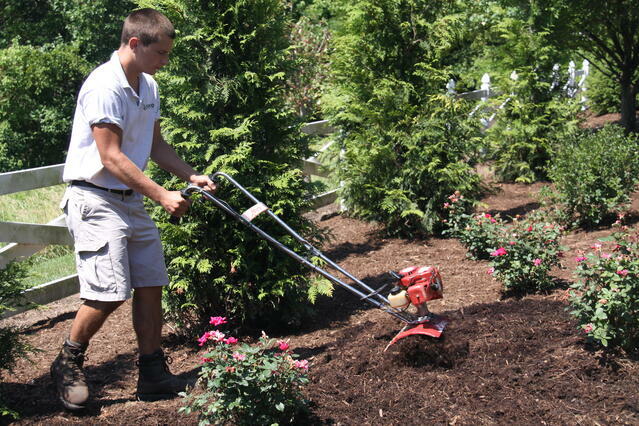 A bed cultivation extends the life of your mulch that was applied months before without the cost of fresh mulch. The benefits don’t stop just with the aesthetic values! A bed cultivation will reduce water run off and allow nutrients to get to the root zone of your plants. The aerating aspect is beneficial in letting the roots have more space to spread out and grow along with keeping the soil at the correct temperature. Dowco helps your property sparkle year round!